Honda’s Asimo robot caused many a jaw to drop over the years, its impressive array of talents for a long time putting the diminutive android well ahead of the competition. But the Japanese company recently announced it’s retiring its creation after decades of development. The last of several versions left the workshop in 2011, though further refinements were made to the robot’s skill set three years later. The work isn’t wasted, though, as Honda said it’s transferring Asimo’s technology to other projects for single-person mobility vehicles and self-driving cars. Asimo’s on-board computer and numerous servo motors enabled the 131-cm-tall (4 foot 3 inch) robot to run and jump, climb stairs, handle objects, play soccer, and even dance. Beyond its physical smarts, it could also converse with humans, interpret gestures, and respond to commands. It’s with some sadness that we bid farewell to Honda’s renowned robot, but let’s take this opportunity to celebrate Asimo’s awesomeness with a collection of its finest (and not so finest) moments. What many found so amazing about Asimo was its extraordinary agility while performing kinds of actions. Although Asimo moved as if it’d just received a painful kick in the technicals, the android could nevertheless run at a decent speed of 5.6 mph (9 kmh), and also hop on the spot, with its balance maintained by numerous sensors. And all this was in 2011, a whole four years before all of these robotic finalists at a DARPA contest made a hash of just about everything, with many of them looking as if they’d come straight from a boozy night on the town. OK, it’s not quite Michael Jackson at his peak, but the sight of 10 Asimo robots strutting their stuff is still one that’s guaranteed to put a smile on your face. Honda produced the short video as a fun way to show off Asimo’s fluid movements and ability to function as part of a team. The perfectly synced performance may have caused concern among those fearing a robot takeover, but, to be honest, Asimo always looked too darn cute and friendly to pose a serious threat to our existence. Asimo even got to meet a serving president, greeting Barack Obama at the National Museum of Emerging Science and Innovation (aka Miraikan) in Tokyo in 2014. After introducing itself, Asimo was keen to show off its soccer smarts, passing a ball to the former White House occupant with the kind of skill and finesse that continues to be sorely missed at the annual RoboCup soccer contest. The final version of Asimo, unveiled in 2011, showed marked improvements in the robot’s dexterity that enabled its human-like hands able to perform a wider range of functions. In the video above, marvel at how Asimo performs a task most of us take for granted, but which robots at the time found pretty much impossible to complete without causing a mess or making themselves look a bit silly. Able to pour drinks, Honda then showed how Asimo could function as a delivery bot, taking coffee to office workers, though such a role seemed to fall well short of making the most of Asimo’s many abilities. The video shows Asimo bringing a tray of coffees to a woman at a desk. After bowing, the robot saunters off, apparently forgetting to take the remaining drinks to other workers in the office, though a small software tweak would no doubt have seen to that. Honda always made much of Asimo’s ability to climb stairs, partly because few other robots could perform such a feat, and partly, perhaps, because it never quite got over the humiliation suffered by Asimo when it toppled down a flight of stairs during an appearance in Japan in 2006. Halfway up the steps, Asimo turns to look at the audience as if to say, “Pretty cool, huh?” before a catastrophic malfunction causes it to suddenly crumble into a heap. Instead of simply carrying the defective robot away, stagehands rush on to put up a screen around Asimo in an apparent bid to protect its dignity, or to stop anyone taking photos. Trouble was, someone shot the entire incident and posted it on YouTube. On the stage, Honda displayed its famous “power of dreams” tagline, but this particular Asimo performance was nothing short of a nightmare. It’d be churlish to end on a negative note, so we won’t. 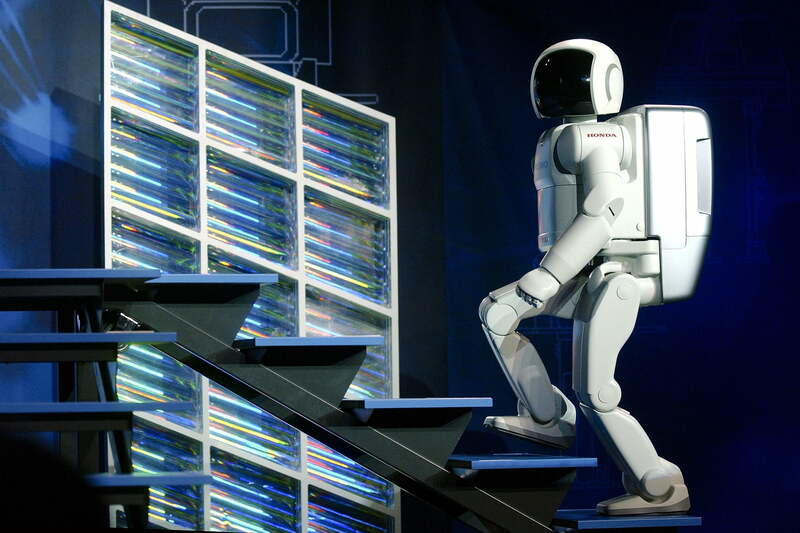 We’re happy to report that the final version of Honda’s robot well and truly nailed the stairs routine, evidenced by plenty of online videos shot at various live events, as well as this albeit carefully choreographed sequence showing Asimo climbing and descending a number of steps with ease.